Rewinder machine adopts PLC computer programming, it can produce paper rolls full automatically with high speed. The finished product is neat and in good order. The production process is unwinding–embossing–perforating–cutting. Price is very favorable. 1. PLC (computer) control production, degree of full-automatic of production process is high, the function of machine is complete, and production efficiency is high. 2. Load and change the core, spray glue, seal can be done without stop the machine. When changing the core, the machine will low the speed and up the speed automatically. 3. When change the core to rewind, it will be tight first and then loose, to avoid the core loose. 4. Equipped with automatic alarm to indicate filling up of core pipe. The machine will be automatically stopped when there is no core pipes. 5. When raw material broken, the machine will stop automatically. 6. 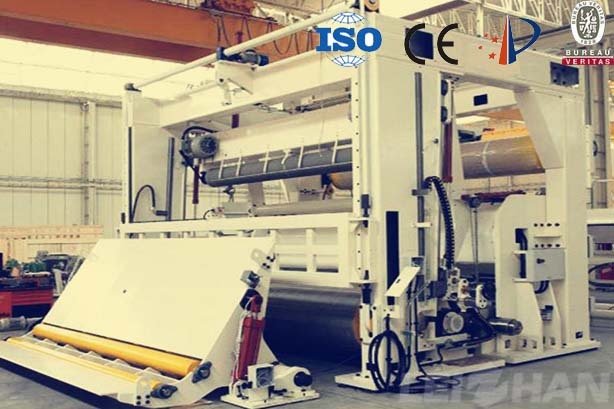 Each raw material unreel separately , equip with tension control. 7. Easy to adjust in order to suitable different paper core. 8. There is tail after the finished product sealed with glue , easy to use. Rewinder machine technical data can be designed according to your demands, if you have any need, feel free to contact us for more details.